In this Tuesday, Oct. 16, 2018, photo, Stephanie Bilodeau, right, holds on to a Brown pelican she rescued from the roadside, while Lianne Koczur attaches a solar-powered transmitter, along Highway 48 near Brownsville, Texas. Solid median barriers along a South Texas highway could be modified to better protect nesting pelicans from being struck and killed. The Brownsville Herald reports more than 40 brown pelicans were killed Oct. 15 along Highway 48 connecting Brownsville and Port Isabel. 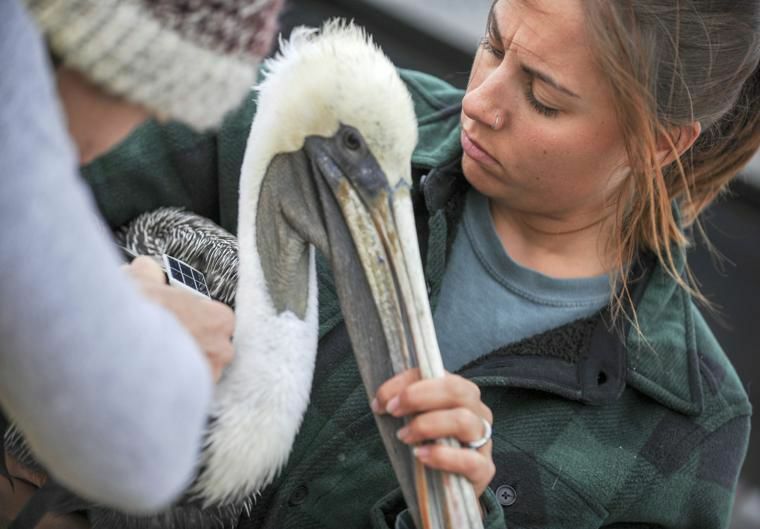 An incoming cold front will provide relief from warm weather, but it also spells peril for pelicans that nest in the Bahia Grande. A strong cold front is expected to move into the Rio Grande Valley on Friday and drop temperatures to the low 60s, said Matthew Brady, a meteorologist with the National Weather Service in Brownsville. Northern winds are expected to be 25-30 mph with possibly higher gusts, and temperatures will likely be in the low 50s by Saturday morning. Last month, the Texas Department of Public Safety reported that motorists struck and killed more than 40 pelicans landing on the Carl “Joe” Gayman Bridge, a stretch of Highway 48 connecting Brownsville and Port Isabel. Octavio Saenz, Texas Department of Transportation spokesman, said a TxDOT study of the bridge yielded a design for concrete rails to mitigate the conditions that cause the birds to land there. The rails are expected to be added by winter 2019. Currently, the Highway 48 bridge creates a vortex during cold fronts pushing in from the north that makes it difficult for pelicans to fly over or take off from the bridge, putting them in the path of oncoming vehicles. He echoed Brady’s message for motorists to be on the lookout for volunteers rescuing pelicans on Highway 48. Weekend highs will likely remain in the 50s and 60s, possibly rising to the low 70s on Sunday, Brady said. The cooler weather could extend into next week, he added.